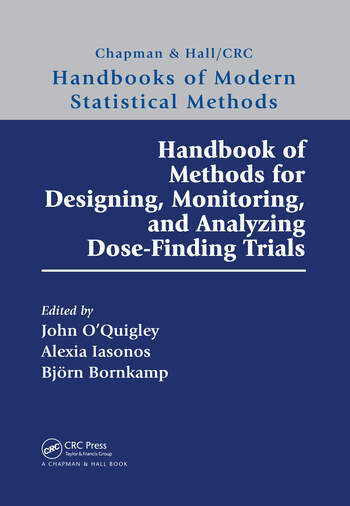 Handbook of Methods for Designing, Monitoring, and Analyzing Dose-Finding Trials gives a thorough presentation of state-of-the-art methods for early phase clinical trials. The methodology of clinical trials has advanced greatly over the last 20 years and, arguably, nowhere greater than that of early phase studies. The need to accelerate drug development in a rapidly evolving context of targeted therapies, immunotherapy, combination treatments and complex group structures has provided the stimulus to these advances. Typically, we deal with very small samples, sequential methods that need to be efficient, while, at the same time adhering to ethical principles due to the involvement of human subjects. An extensive guide for the multiple comparison and modeling (MCP-Mod) dose-finding approach, adaptive two-stage designs for dose finding, as well as dose–time–response models and multiple testing in the context of confirmatory dose-finding studies. John O’Quigley is a professor of mathematics and research director at the French National Institute for Health and Medical Research based at the Faculty of Mathematics, University Pierre and Marie Curie in Paris, France. He is author of Proportional Hazards Regression and has published extensively in the field of dose finding. Alexia Iasonos is an associate attending biostatistician at the Memorial Sloan Kettering Cancer Center in New York. She has over one hundred publications in the leading statistical and clinical journals on the methodology and design of early phase clinical trials. Dr. Iasonos has wide experience in the actual implementation of model based early phase trials and has given courses in scientific meetings internationally. Björn Bornkamp is a statistical methodologist at Novartis in Basel, Switzerland, researching and implementing dose-finding designs in Phase II clinical trials. He is one of the co-developers of the MCP-Mod methodology for dose finding and main author of the DoseFinding R package. He has published numerous papers on dose finding, nonlinear models and Bayesian statistics, and in 2013 won the Royal Statistical Society award for statistical excellence in the pharmaceutical industry.